Who doesn’t want to live in a spacious house, especially if they have a big family! But some may go to extremes in terms of space. Some houses reach enormous sizes, a size that can house a small village not just a family! The biggest house in the world is indeed a giant one. But to find out the biggest house in the world we need to first establish our criteria, are we looking for the largest house in terms of space? Or the biggest house in terms of the number of rooms? Or the most expensive property overall? We have some various houses here for you, some extend vertically and some horizontally! But all of them are extremely expensive and gigantic in size. What combines all those houses is that all of them are residential properties, real families live in these huge mansions. Let’s take a look on some of the most impressive enormous architecture out there, and find out which house deserves to be called the biggest house in the world. Listed for sale for an excess of US$138 million in 2005, Updown Court was the most expensive private home on the market anywhere in the world at the time. This Californian style residence spreads over a vast area of 230,000 square meters. It comprises 103 rooms 24 of which are bedrooms with luxurious marble en-suite bathrooms. The house also features beautifully landscaped gardens as well as private woodland. In addition to its renowned feature, a 3 million USD heated marble driveway. And of course a house this big does not lack for a swimming pool, there are five swimming pools in the mansion, including an Infinity pool. And if swimming is not your sport of choice, the house also includes a fully automated two-lane bowling alley, a squash court, and a tennis court. If all that is not enough this giant mansion includes a customizable cinema with a 50-seat capacity as well. 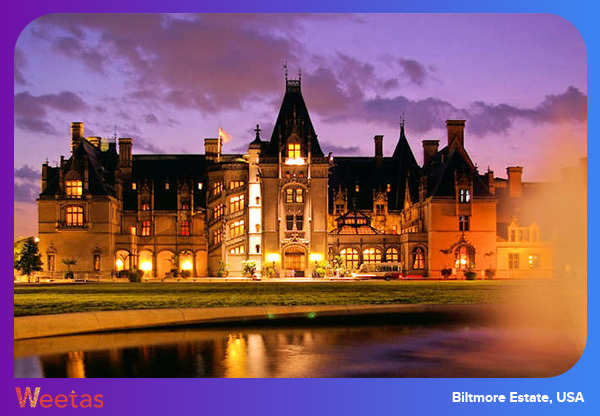 At 16,622.8 square meters, Biltmore Estate is the largest privately owned house in the United States. The mansion was built by George Washington Vanderbilt II between 1889 and 1895, it is still owned by his descendants. Construction of this humongous house required the labor of more than 1,000 workers. A woodworking factory and a brick kiln were built onsite to facilitate the work on the project, and a three-mile railroad was constructed to bring materials to the building site. The house comprises a total of 250 rooms including 35 bedrooms for family and guests, 43 bathrooms and three kitchens. It also feature various amenities that were novelties in the 19th-century such as electric elevators, air heating, centrally controlled clocks and fire alarms as Biltmore House had electricity from the time it was built. Almost all these things are antiques now; they add even more of a value to the grand house. 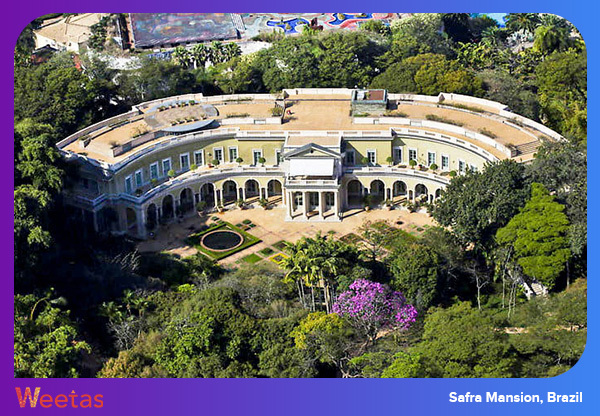 Extending over an area of 117,000 square feet, this house is the largest private residence in Sao Paulo. It is surrounded by a very high wall. Even though very little photos of the house are available online, it is known that the 130-room mansion comprises two swimming pools, an outdoor pool and an indoor one. Sprawling over an extensive area of 33,000-square-foot, Michael Dell’s home outside of Austin is known by locals as “the Castle”. The huge mansion is perched on top of a hill and surrounded by high walls and extreme security. However, it is reported to comprise eight bedrooms, 13 bathrooms, a tennis court, indoor and outdoor pools, as well as stunning views of Lake Austin. 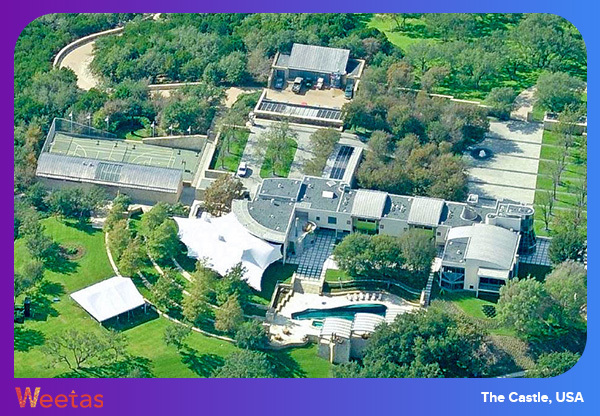 Valued around $2 billion, this is definitely one of the most expensive houses in the world. It can also be considered the biggest house in the world albeit its substantial size is mainly vertical. This house is a family residence that belongs to the richest person in India and one of the richest men in the world, Mukesh Ambani, chairman of Reliance Industries. He inhabits the house with his family. It is more of a skyscraper than a regular house, 27 stories high with extra-high ceilings. Just to demonstrate, buildings of equivalent height usually have between 50 and 60 floors. 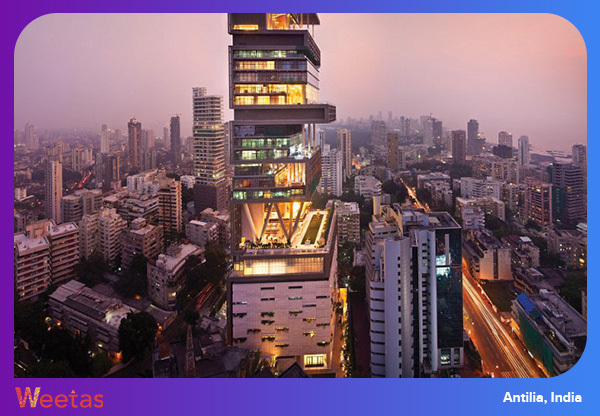 The cherry on top, literally, is that the top floors of Antilia offer stunning panoramic views of the Arabian Sea. It may be considered the tallest single-family house in the world, but because it includes space for a staff of 600 to maintain the residence 24 hours a day the issue is a little controversial. The biggest house in the world is in fact a palace; well it is world’s largest residential palace. Spreading over an area of 200,000 square meters, this house is the official residence of the Sultan of Brunei, Hassanal Bolkiah. The construction of the house was completed in 1984 with a total cost of around $1.4 billion. 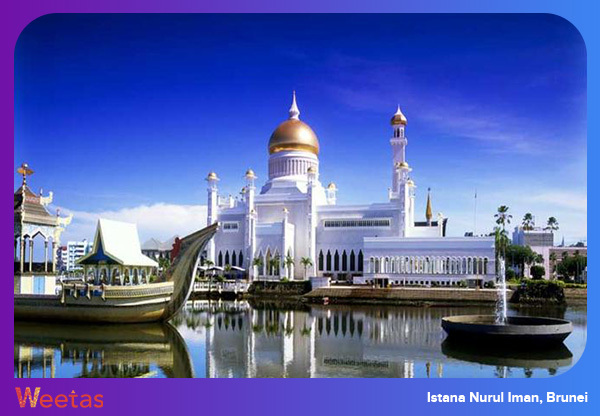 Upon completion, Istana Nurul Iman became the largest residential palace in the world and the largest single-family residence ever built. The palace comprises 1,788 rooms, including 257 bathrooms. In addition to that, the palace houses a banquet hall that can accommodate up to 5,000 guests, and a mosque that can accommodate 1,500 worshiper. The palace also features an air conditioned stable that is home to 200 polo ponies, a 110-car garage, and 5 impressive swimming pools.